Having a client request that you are on-site at 7:00 AM has its upside. I may see the sunrise someday soon and there is little traffic. In the SF Bay Area, the latter means a lot. 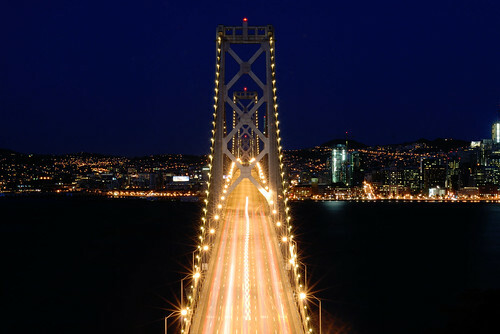 The shot above is one I took of the Bay Bridge in the pre-dawn hours. Cool picture Jack. I've been in downtown Seattle all this week with early starts - great to see Rainier with the sun just coming up. As you say - it makes it all worthwhile. That's a stunning image, looks like there are a few car lights. On an unrelated topic I recently read that the Golden gate bridge in SF is America's most popular suicide spot - sorry just my morbid side coming through. The previous article is Date Math - DateAdd, ProjDateAdd in Microsoft Project. The next article is Sign of the Times - Libraries During Economic Crisis.